Plinky Prompt: Which food transports you to childhood? My friend, Maureen, is just going to LOVE this one. I will preface my answer by saying that my mother is of German/French descent and my father was from Vienna, Austria. So, the playing field here is really not equal. We were brought up with some unconventional (to American standards) ways. The answer is rice with ketchup. 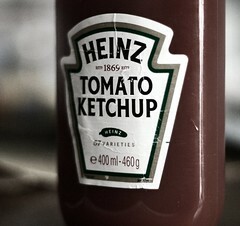 ( it could ONLY be Heinz) I don’t have it very often but once in a while I do have a craving for the good old days. Yes, I did pass that particular culinary pleasure on to my son who still eats rice that way. In fact, our son used to eat ketchup on everything including the ketchup (nothing else) sandwich days. Our daughter just ate her rice with butter. After that it would be noodles with ketchup (we didn’t know the word pasta.) It was only in college that I learned about tomato sauce, it was never in our house, ever. Our family was invited to a friend’s house one night and they served lasagna, it looked good to me but my father? Oh my, he hated it and complained about it for days. It was just too complicated and foreign to him. I learned about all these “exotic foods” when I went to college. Tomato sauce not ketchup? Honestly, I could still go either way. Butter, however, was the great equalizer. Substitute butter (or add to ketchup) for a tasty treat. I don’t think it works with marinara sauce at least I’ve never tried it, but, if you think about it, why not? How could butter be bad on ANYTHING? p.s.Hey Mo, I bet you thought I was going to bring up pizza and grape jelly but I couldn’t; that started in college. Silly. I’m being a bad patient. Yes, I’m confessing. I have a doctor’s appointment with a new rheumy (as us Fibro patients like to call them) a new rheumatologist in about a week and I think I am going to postpone it. Again. My old rheumatologist who I do indeed love, takes about three hours to get there and back, usually more, and this one is only twenty minutes away, I’m getting lazy. However, this is the height of flu season and I really do not want to expose myself to the “flu factory” that is my doctor’s office. It is not just one office, it’s two buildings of sick people for every specialty in the world. It’s a factory for any illness you can think of. In addition to having Fibromyalgia, I also have an auto-immune disease of the thyroid called Hashimoto’s Thyroiditis. Just glance at me and I will catch it. Sure, I suffer from the tender points, but I don’t even count them, they are as natural to me as getting up in the middle of the night to pee. I accept it. And yes, I have all the other symptoms of Fibromyalgia: IBS, tingling, headaches, “yada yada yada*” but overall I feel better. I’m not asking for fabulous, I’m just satisfied with better. 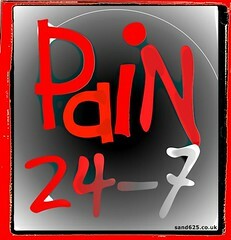 Better to a Fibromyalgia patient is like a miracle, BUT it is a miracle for however long it lasts. I think a lot of it has to do with my endorphins being raised quite a lot. Wish I could say it was from exercise but let’s not get too crazy here. It’s the result of medication, and no, not-self medication. Right now, I’m just appreciating feeling a little different, in a positive way. I want my Fibro friends, and the newbie Fibrosmyalgia patients to know that it is, indeed possible. Don’t give up hope, maybe one day you will feel better too with the right combination of medicine. Keep fighting. I know there is no cure but you need to trust your doctor, or team of doctors and they need to believe in YOU. For now, until it changes, I am happy, fine, content. Do I think it will stay like this? Probably not. Do I hope so, definitely: yes. But, as we all know with Fibro, we have absolutely no control over anything, which really is the hardest part of all. Let’s wish each other a whole lot of luck. If you have questions for me, especially those who are new to Fibromyalgia, feel free to ask, I’m happy to help. I brought Lexi, my dog, to the vet a few months ago to get her nails trimmed, something I know I can’t do. 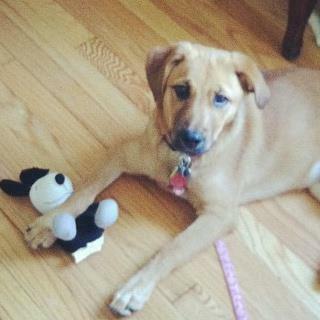 She is a very willful and strong dog, I can barely give her a bath. After they were finished, the vet technician came over to me, sat down beside me and said grimly “Lexi needs to lose 2 pounds AGAIN.” My first thought was to laugh heartily and say “Who doesn’t?” but the look on her face prohibited even me, which as my kids can tell you, is very, very hard. After suppressing my laughter and pretending to look chagrined, she informed me that Lexi needed to start adult food mixed in with her puppy food and go down from 3 meals a day to two. My first thought? Good luck to us! That dog, lives, breathes and does anything for food. She, absolutely, takes after her human parents. I think I will give her less food for lunch time and wean her off it that way. Come on, a girl dog does have to eat and I took her on an extra walk today. It’s so beautiful out that I will take her to the dog park later and she can run and play with the other dogs just like she did yesterday. Were vets always like this? I don’t think so and I know it makes sense to keep them healthy but we’re not talking obesity, we’re talking two pounds. It’s the winter, harder to take her for long walks when it is so cold. Not a good enough excuse? Fine, I will also decrease her food, poor thing. At least this time it was only two pounds and I didn’t get yelled at like I did last time. When she was a pup, we took Lexi to a (horrible yes, you, Peter)) puppy training class where she learned nothing except how to sit (which she already knew.) The instructor bribed the pups with a huge amount of treats and Lexi gained ten pounds in a month. I am not kidding. When I went to the vet after that, I didn’t say a word but the technician started yelling across the room, standing up and shaking her finger at me saying: “No, no, no- way, she’s FAT.” I was a little offended on Lexi’s behalf. She may have gained a few pounds but saying it across a crowded room was embarrassing. At least for me. I totally blame that stupid trainer, I knew I should have gotten my money back. Damn. Now, Lexi looks fine, she looks sleek. I want her weighed this time. We’ll show old Weight Watchers For Dogs what we have done. And we didn’t even count points or calories either. So there. I’m bringing her in tomorrow, I’ll let you know how WE do. *this has nothing to do with the Weight Watchers Corporation, it’s a parody for dogs. Of course they are silly. Of COURSE I have some. My biggest one is that I will not walk under a ladder, no way, no how. Never did and hopefully, never will. I do cross my fingers for luck, hate it when a mirror breaks (oh no, seven years of bad luck,) but I don’t take these things as seriously as the ladder. On the other hand, I don’t hate the dreaded number 13 or even Friday the 13th. I do notice when a black cat crosses my path but I can deal with that, no problem. I sit on the faded pink chairs, I know from every year before this, where the greasy stains are. The same old tattered magazines and breast cancer pamphlets are on the table. I sit in the chair facing forward as if I was on a train, leaving nowhere fast. I measure my time annually by these mammogram appointments. I can’t believe it’s been a year already. I am given the thin, green hospital robe and the same monotone speech, no body wash, no cream soaps, no deodorant and I make the same stupid joke every year in my head (“that’s going to be worse for you than me.”) I had a lump removed from my breast when I was 25, luckily it was benign but I remember the shock, and the experience in detail. I remember that the surgeon made me cry and the nurses comforted me. I’ve had a mammogram every year since. I am now 56 years old. I know the instructions by heart but as soon as they tell me what to do, I forget. As soon as the nurse closes the curtain that makes that whoosh-metallic sound, I have no idea which way to put the gown on, my hands shake and I am nervous. I tell myself that I am sure everyone else here is anxious but that gives me no comfort. 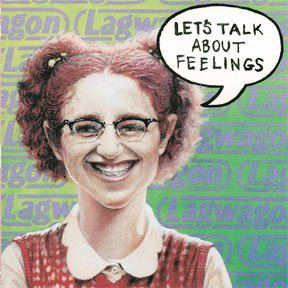 I wish I could be the type of person that could hide my feelings but I would need a full lobotomy for that. My feelings are seen from a mile away, they glow in neon orange lights like a flashing danger sign. Finally it is my turn. A technician leads me into the mammogram room, I don’t complain about the discomfort ever and then I go back to the waiting room. I wait a long time, in fact I notice that all the women who I had been with have already left. There are a new batch of women here, waiting to be called in, having their tests and waiting with me. One by one they are leaving too. Now, I am really worried, this does not feel right.There are no nurses to ask, they only come in sporadically but as soon as I see one I ask her politely to please find out what is going on. She is kind (and you remember every kind word) and tells me they need two more pictures. They take two more pictures. Once again I am in the waiting room now waiting for my ultra sound. In every year before they have called me into the radiologist for the results of my mammogram BEFORE the ultra sound but not today. When, after thirty minutes, the nurse tells me to come for my ultra sound, I ask her the results of my mammogram and she says “we NEVER tell that to the patient, the radiologist tells you after both tests.” I have come here for the last fifteen years and it’s never been done like that but I am too weak to argue. Once in the ultra sound room, the technician does a thorough job and I noticed her focusing, over and over my right breast. I asked if there was anything wrong and she laughed and said “I can’t tell you but the radiologist will give you the information.” “Don’t get dressed” she says as she leaves and I know that is a standard procedure. As if I was in a bad dream the technician comes back and says the radiologist wants a few more pictures. I have been here for three hours and I am trying very hard not to weep with exhaustion and fear. Finally, they call my name for the radiologist. My whole body is shaking and my legs feel like jello. I hold on to the walls for support. The radiologist says glibly “You’re fine.” “Yeah, you’re fine, no changes from last year, good to go for another year.”He give me a slip of paper and with a wave of his hand he encourages me to leave. I had lost my voice. I finally managed to ask about the nodule and he said they had compared it and nothing changed. Thinking back I was in shock; it reminded me of the time when I did have a lump in my breast and it had to be removed.I remembered having to wait so long for the biopsy, more than a week. I knew I had heard good news today but it hadn’t sunk in yet. I walked back to the changing room with fingers trembling and slowly changed back into my clothes. I was grateful, believe me I was grateful; my emotions just hadn’t caught up just yet. *Please note that more women die of heart failure than all cancers combined. My breast surgeon told me that one day, smirking and grinning widely, telling me it was “good for his business.” Visit Carolyn Thomas’ page Heartsisters.org for more information. I need to find forgiveness in my heart. I know that’s the right thing to do; I just don’t know how to do it. How do you forgive people whose bond with you should be so natural, so instinctive? I don’t have the answers but I am trying to find them. I am trying to find them so that we can all live in peace. I think the psychologists call it “individuating;” when you separate from your parents and become your own person; believe me I don’t think my parents would call it the same thing. It took me a long time to understand the game they played, unwittingly, but I swore I would never fight with them again. Since they couldn’t express any feelings at the time they would hold something against me for weeks. Eventually, one day there would be a vitriolic, icy cold lecture of how I had changed. I would figure it out in time but it left me stunned, still hurt. However, I did not offer myself up as a sacrificial lamb; that was no longer my duty, those days were over. When all was is said and done, what they really needed was attention, to feel wanted and needed and not dismissed. It was quite simple once I figured it out and I was more than willing to give it to both of them, on my terms. Once I did, they became nicer, happy for the attention and we seemed to get along better. Sometimes, the things people say are irrelevant, I guess you need to go deeper and see what they are feeling. Not everyone wears their heart on their sleeve like I do. As I have said before, words don’t count, actions do. Since we were talking about forgiveness there is another very important person I need to forgive. Me. I need to forgive myself for all the grudges I have held, for all the hurt I have carried, for the blame I have caused and for all the tears I have shed. I was just a child, an abandoned child. I know I will never forget but I need to forgive myself and let go of the pain because true forgiveness really means setting our souls free, the greatest gift you can give yourself. At least that’s what I’ve heard. 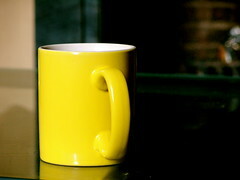 For my birthday last year, my best friend bought me a lovely bright yellow mug for my coffee. She knows yellow is my favorite color. Drill me from the car. Look, just tell us, the viewing audience, the truth. 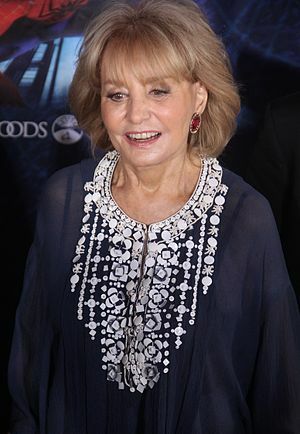 There is no way in hell that our Barbara Walters is still in the hospital for a boo-boo on her forehead and a low-grade fever. What else is going on? I WANT AN UPDATE. I don’t care if Whoopi Goldberg/Joy Behar read some funny statement allegedly from Barbara Walters on the air three days ago. We want answers now. Hey, I’m not the paparazzi, I don’t want photographs, I just want an updated statement because this situation is worrying me. Barbara is the queen of all things, she’s a legend. To make us all think that this is all from a cut on her forehead is ridiculous. Yes, of course, she is entitled to her PRIVACY, I do understand that but making the American public seem stupid is downright degrading. Barbara, Bubele, what can I say? I’m a Jewish mother that cares. Can I bring you home-made chicken soup? I will have my people (okay, I know I don’t have people) get in touch with your people so they can taste it, test it, and do whatever they have to do to make sure it’s safe? I envision the secret service taste-testing my soup; that’s okay, I will bring enough for all, including the “girls” on the show. I hope you came home over the weekend because I am getting anxious and I hope your daughter is with you, just for company. Believe me I have been well trained from my mother. Feel better, get stronger and while I do not watch The View religiously, I may have to watch it on Monday to see if there is an update. In fact, maybe I will call in or send e-mail to see how you are doing. If I had a lot of money (like Oprah) I truly would send you flowers but I don’t so, think of this blog as your Get Well card. Hope to see you on The View.